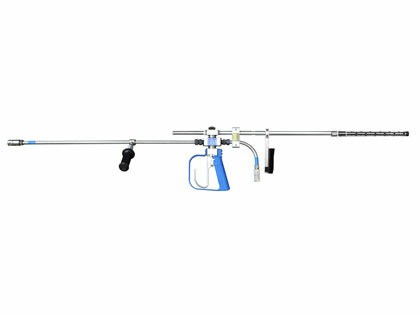 NLB’s NCG24-535UW water jet lance is designed for underwater use. It features a second jet that exits the rear of the lance, counterbalancing the thrust that comes from the front nozzle. This allows the diver to stay in place while working underwater. The lance also includes all the features and benefits of our standard lances to provide maximum operator protection and productivity. A patented trigger (U.S. patent no. 5,636,789) lets the operator dump pressure immediately by simply pushing forward. It can be operated with just 8-to-12 pounds of pressure, and a one-finger latch prevents accidental actuation.